Two BPTC students from The City Law School have taken the top prize at the Human Rights Lawyers Association Judicial Review Mooting Competition. 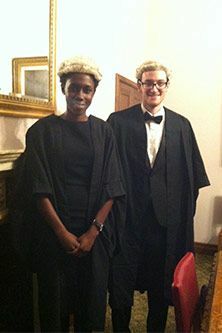 Matthew Fraser and Jelia Sane beat eighty-four other students from the UK's leading law schools. The moot problem was based a recent Government consultation paper which proposed restrictive amendments to the procedure rules for judicial review applications. The teams were asked to consider the compatibility of these amendments with Article 6, the right to a fair trial, and Article 14, the prohibition of discrimination, of the European Convention on Human Rights. "We had both previously taken part in mooting competitions at University however we found that the skills picked up on the BPTC at City were invaluable. The technical drafting and opinion writing skills that we learnt throughout the year helped us when writing our statement of grounds and ensured that we made it past the initial paper-based round". From the initial entries, ten pairs were selected to make oral submissions to a panel of senior public law practitioners. In turn, they chose two teams to compete in the final; The City Law School and the London School of Economics. "Whilst the prospect of mooting at Middle Temple before a formal dinner was daunting, the advocacy training received on the course at City meant that we were well-prepared for the task. Once we got into the flow of our arguments, we found the experience very enjoyable. It took a lot of hard work but it was absolutely worth it".